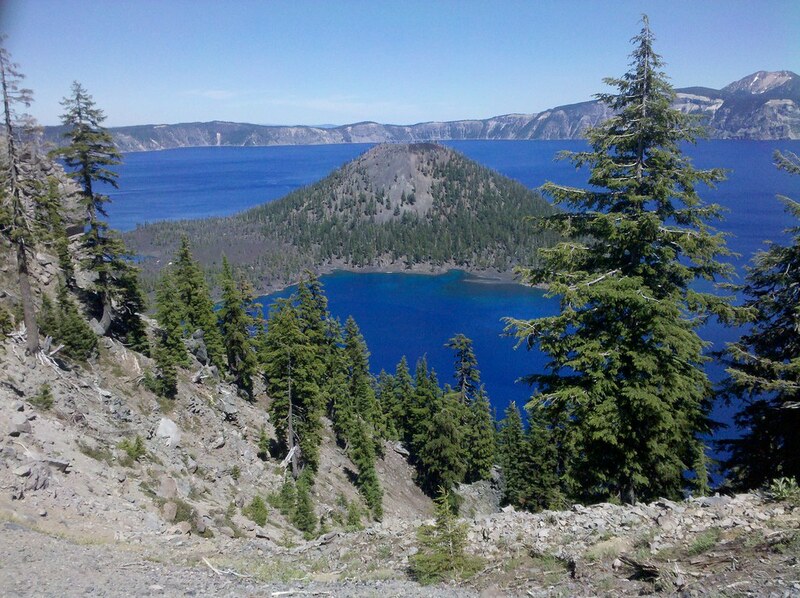 We really were not stuck at the junction of 'leaving Crater Lake' and arriving at the small town of Chemult, for as long as this interruption in writing about it took. Yesterday was my birthday and I celebrated by bicycling around Davis, California. I visited Delta of Venus cafe having a warm vegan soup, then browsed the artist cooperative The Artery (pretty colors, waxes, fabrics, turned wooden bowls) then rode out to D–Q University, where the local permaculture group was planning, earlier in March, 2011, to go to assist planting fruit trees as DQU was having a tree planting with CommonVision.org's "Fruit Tree Tour", but the planting had been cancelled because of rain, twice. I had not yet seen the physical area of DQU yet, so was happy to have the opportunity of bicycling out there and back yesterday then ending up at the Davis Food Co-op. I was also happy to see the Yolo County Airport as I bicycled past, cause I like airports. The evening before, I was going to go to a memorial for Japan "Haiku4Japan" but missed being at the event, instead joining the organizer for "Japanese Fondue" (finding out it is actually Shabu-Shabu) as well as having my first experience of a sake bomb. I felt it had some elements of irony, a sake 'bomb', as we all talked about climate change, Fukushima, radioactivity. None of the other restaurant patrons seemed to notice when the group around me sang "Happy Birthday" to me. We then humored that they might be possibly relieved, contrasting to the quiet but gloomy end civilization discussions going on amongst us previous. Since my last update in December, I have been busy in the present. I have been searching for healthcare and healthcare options, a search with no right answers, but lots of potential pitfalls. We ( NevadaDesertExperience.org ) had a decision of whether to hire an intern whose references were good, except from where it counted the most. The Sacramento Valley Permaculture Guild group lost then gained an organizer. I helped paint the new tool shed in the Community Garden. Computerwise I have been mapping out the summer bicycle ride on MapMyRide.com , as well as studying CEUs for my regular license renewal and enrolling in Geography course. Socially, we have had our friend Shannon leave for a crewing trip across the Pacific Ocean, multiple CouchSurfers and CouchSurfing meetups for the New Year. Then in January, a founder of Nevada Desert Experience, Sr Rosemary Lynch died, all requiring bits of my time to organize, reorganize and publicize. Additionally since the beginning of the new year, there have been initial appointments with new-to-me healthcare providers, as well as the excitement of finding people who have a diagnosis of narcolepsy on the internet, surprisingly enough for me on facebook. The local Sacramento CouchSurfing group got a boost of energy as I 'made' a number of new moderators for the group such that there are more regular local group events. I also had a class reunion, something I had not ever "planned" on going to. In going I felt it was a challenge to go, challenging the accumulation of ideas that I had of how other classmates perceived me then and might perceive me now. My perception of myself, from high school, was that I was a sleepy kid that was "nice" but often not able to have enough energy to arrive in class. I missed being in class often, sometimes by my accounting, about a third of the time absent. When I did have energy to arrive, I recall feeling sleepy due to a now explanation of an undiagnosed narcolepsy. I even missed the class photo opportunities, so there really was no visible enduring sign I was even in the high school class. I was very happy to have been able to be at the reunion. I had enjoyed seeing where the other people were at in their lives, hearing their perspectives. Busyness: Been organizing regular meetups for the Sacramento Valley Permaculture Guild, the offshoot: "Liberation Permaculture" meetups, and regularly occurring Sacramento CouchSurfing get togethers. My class for geography "Weather Studies" has also been consuming my time. Reading about the ongoing Fukushima events, and how it might affect the number of participants on the upcoming Sacred Peace Walk 2011. Maybe more people would come to protest against nuclearism, but maybe some might avoid being involved because of fears of possible additional radiation exposure. I felt this was a good short blurb for the Sacred Peace Walk: " : Nuclear power and nuclear weapons are never safe. Join Nevada Desert Experience on the Sacred Peace Walk 2011 , April 17 to April 25, from Las Vegas to the Nevada National Security Site (formerly named the Nevada Test Site) to protest nuclearism. The SPW this year ends at the NNSS as the world commemorates the 25th Anniversary of the Chernobyl Disaster." When I lived at Lost Valley, near Dexter Reservoir, 18 miles southeast of the Eugene area of Oregon, I would often take the Amtrak Coast Starlight back and forth to the California Bay Area visiting for a week each month. The Amtrak station stop before the Eugene Amtrak Station was Chemult Amtrak Station where, due to the timing of the train, it would often be early dawn or late at night when the train passed through the small town with a very brief stop. For three years I had wanted to visit and explore this tiny town that I had only seen from the vantage point of the train window, more often than not seemingly covered in snow. 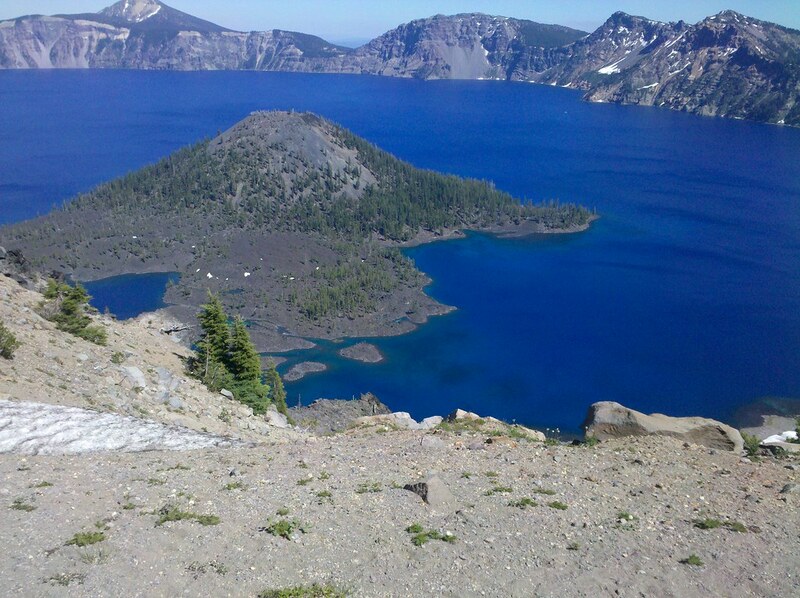 We left Crater Lake National Park, from the northern park entrance, and had the choice to either undertake a more hilly route called the "Windigo Pass" (that might have long stretches of unpaved gravel roads) that would take us toward the Willamette Valley and the Eugene area, or go east toward the flatter highway traveled area on the route toward Chemult and then Bend, Oregon. "Windigo Pass" sounded formidable, S's recumbent bicycle with it's road bicycle tires was less stable on gravel, and we had the idea of a goal of arriving in Montreal, so we headed east. 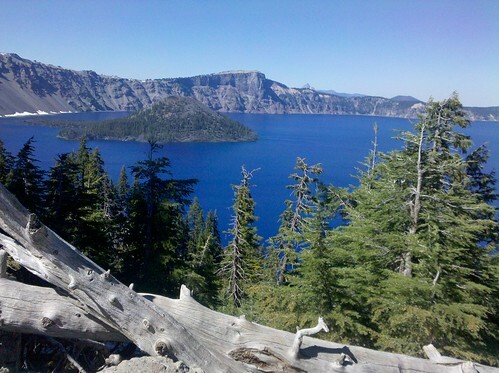 We had multiple mosquito bouts at Crater Lake as well as along North Umpqua Highway No. 138. We decided to get lodging in Chemult. Cute town. Mainly a truck stop. Mostly saw the Pilot Travel Center. 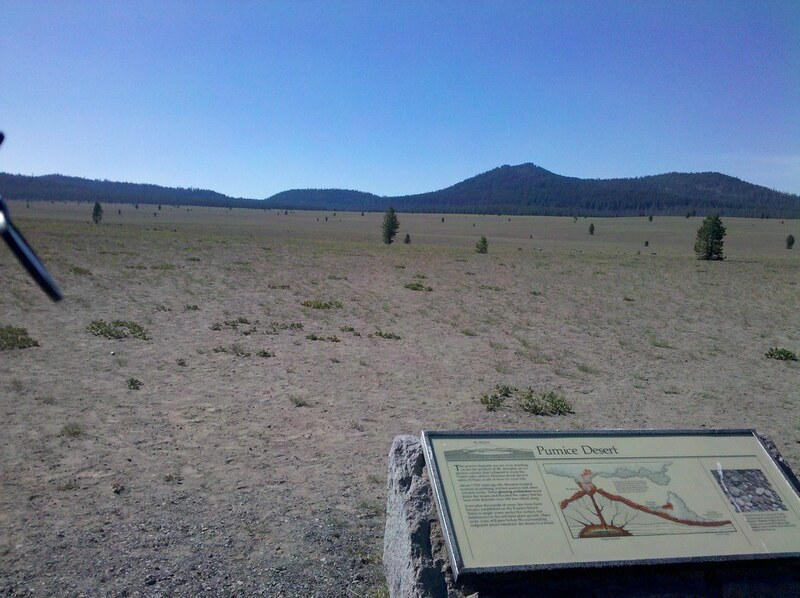 Here in Chemult, we ended being on the Volcanic Legacy Scenic Byway. As we bicycled out of Chemult, along U.S. Route 97 we stopped at a ranger station. I then found out that the "snow Aedes" were the mosquitoes that were the cause of this unusual amount of mosquito activity. 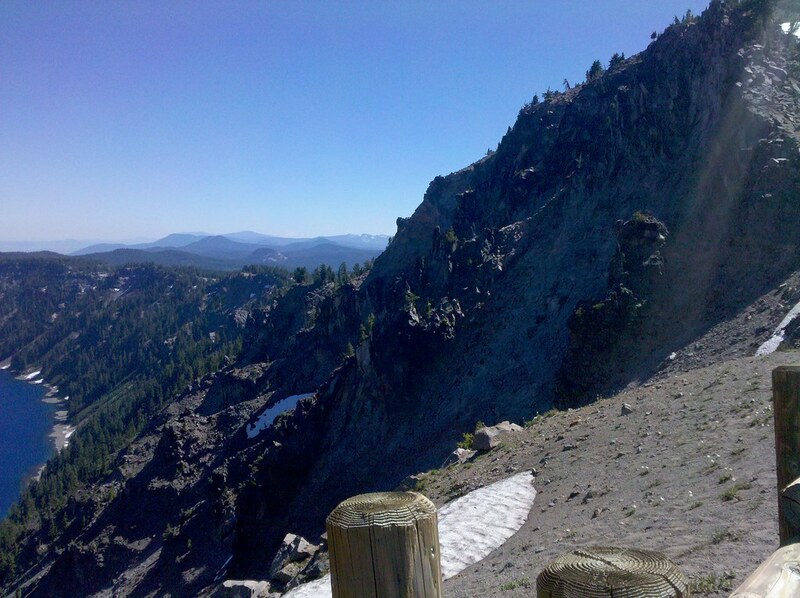 We then headed northwest along Oregon Route 58. Along Route 58, we discovered closeup why there were shredded tire parts along the roadside, as the result of an semi-trailer truck had a blowout of a tandem wheel, notable as the truck kept on going despite the explosion and flying rubber and metal. 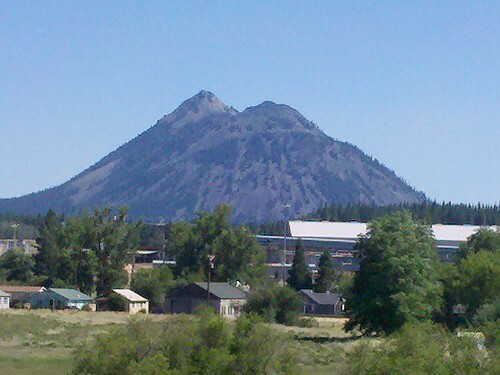 At the junction of Co Highway 1352 we entered the Cascade Lakes Scenic Byway, passed Davis Lake and the Davis Lake volcanic field, then the Deschutes National Forest. Beautiful lava fields, huge areas of sharp looking lava, large areas of burned forest from the Davis forest fire in 2003. 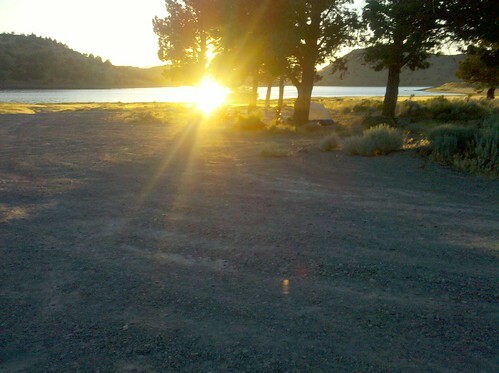 While searching for a site for wilderness camping, we arrived at warning signs about the hazards of the water at Wickiup Reservoir, then there was a crack that fully disabled one of the bikes. We attempted to hitchhike a ride and searched for who we knew in Oregon and was in the memory of my cellphone. So I am hearing wonderings if I am in Oregon. I am seeing that the title, limited by the number of characters, should have been: "Recent Happenings, including my birthday in Davis, California, then back to writing about last summer's bike trip by Davis Lake, Oregon"